Section 498a IPC has created a mess which the Indian Legal System is not capable of handling and has earned the title of ‘the most dreaded law’, which, in reality, has destroyed many lives and families. Let’s discuss how in today’s’ date one can protect from false 498a cases. To escape the clutches of 498a and its damaging effects, one needs to understand the factors which play an essential role in a matrimonial dispute. 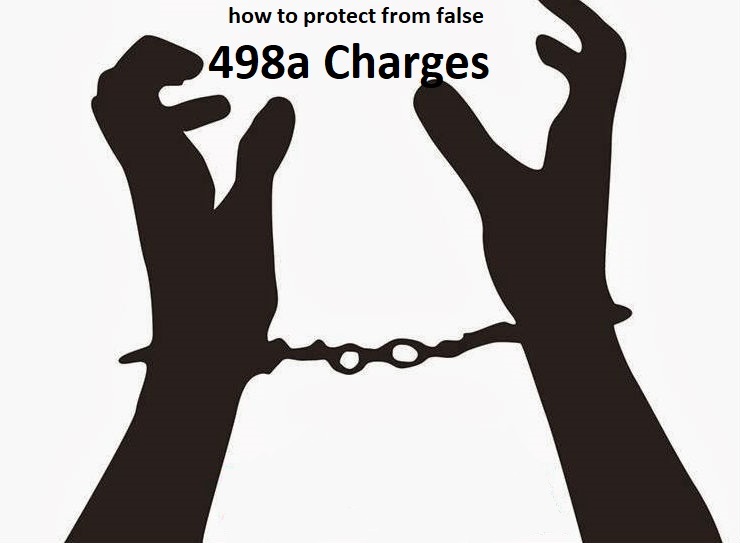 If you are in a rush and are looking for a quick answer on how to escape from false 498a charges, skip to the end of this article. However, I suggest that you develop a complete understanding of the topic instead of resorting to quick measures. Knowledge is power, remember. WHY MATRIMONIAL DISPUTES ARE ON A RISE? Simple or bizarre, matrimonial disputes will remain inevitable until a magic wand turns all humans infallible; and in that case, the institution of marriage is quite likely to go obsolete. I do not intend to say that the institution of marriage is stupid, rather, it is one (the most prevalent) way of balancing out human stupidity, while enabling existence. The institution conditions imperfect humans to nestle, procreate and nurture – while socially subjecting them to an inseparable bond of togetherness. A philosophical mind would rightly question – WHY? Why is it even important to nestle, procreate and nurture? Why is it important to marry? Actually, it is not important, until you think it is. Many reasons can answer the question above – why not, what else is there to do, I love babies, I want a family, I want a companion, I like togetherness, I love him/ her…… yet there is no answer which is perfect. They are all whimsical answers by fallible humans who cannot perceive beyond existence to comprehend the larger purpose. However, there are two very wrong answers to the same set of questions – I have to because I am told. It brings wealth. If you are wondering what could be so wrong about these two answers, I suggest (without being condescending) that you check your premise of morality and ethics before getting married. Behind these two seemingly harmless answers bear the underlying evil of – unreasoned subjugation, and, entitlement towards unearned – greed. Believe you me, those who answer it wrong, make most of the divorce matters that end up on my table. The wrong answers or the evil cannot be attributed to a particular gender, especially, in the cosmopolitan world where there exists a considerable mix of both ‘patriarchic dowry mongers’ and ‘femi-nazi gold diggers’. Am I generalizing? No, not all are alike. There are healthy, productive and progressive marriages that have existed and still do. That’s another story that no one bats an eye while chasing what media finds interesting – spiteful, prejudicial, miserable, horrible, yet, spicy content from broken celebrity homes. While wrong it is to curb a person’s freedoms and dictate lifestyle – for being a woman, as equally wrong it is to put a person under an unreasonable burden of expectation – for being a man. The current generation is somewhere stuck in the middle of fading out patriarchy and traditionalism, and, fading in modernism and equal rights movement. It is a dense cloud that the young Indians are struggling to pass through while carrying backpacks loaded with cultural sentimentalism. The cloud only gets denser when the law enters the field and guarantees protection to one gender. The law carries the good intent of ending cruelty on women on account of age-old misogyny, normalized patriarchy, stereotyped gender roles, and, forced behavioral subscriptions. However, the mechanism upon which the law relies to achieve such good intended end is essentially the police system – dated, unsophisticated, uncouth, highhanded, arbitrary, whimsical, callous, rotten, corrupt, and defunct to a point that rather than checking the misuse of the law, it promotes it by action or abstinence. As matrimonial disputes get denser by the day, the husbands (and family members) often suspect wrongful and false accusation under constant threats by disgruntled wives and their family members. Many people ask what to do under an apprehension of wrongful implication and accusation under 498a IPC. Whoever, being the husband or the relative of the husband of a woman, subjects such woman to cruelty shall be pun­ished with imprisonment for a term which may extend to three years and shall also be liable to fine. Soon section 498-A became a champion sine qua non for Anti Dowry Laws and Cases, thus, facing the tough interpretation of the law as this section is applicable to dowry cases even in the absence of the actual word “dowry” in the section. The reason is that by virtue of Section 8-A of The Dowry Prohibition Act, the husband, and his family members are presumed guilty of the offence. The offences include taking or abetting the taking of any dowry under section 3; or of demanding of dowry under section 4. Since the onus to prove the innocence is burdened on the accused, the, complaints (or their lawyers) took the leverage to resort to an emotional bile spew and levy accusations in an absurd and casual fashion and in absence of any actual specifics or details. The accusations of harassment for compulsive giving of dowry and of further and repeated demands of dowry by husband and family members became a norm. For a decade, the law was abused. Exaggerated claims and accusations coupled with unaccountable power to the executive, and limitations on the powers of judiciary wreaked havoc and lead to wrongful convictions and grave miscarriages of justice. The Secretary to the Government of India, through his D.O. letter in September 2009, requested the Law Commission of India to suggest measures to check the misuse. Further, the Hon’ble Supreme Court of India in August 2010, in the case of Preeti Gupta vs. the State of Jharkhand, expressed that a serious revision and reform of the provision is warranted by the Legislature. Likewise, the best advocates for dowry and 498-A in their respective cases made many more observations in different cases through different forums. In Aug 2012, the Law Commission, in its 243rd report suggested some legislative revisions. These included provisions for compounding of the offence and objectively analyzing the logical strength of the complaint. After ages of subjugation and an era of stringent approaches, we are now on the threshold of a balanced approach. However, neither the sufferance of the male and his family members, nor the dowry menace has ended. At the same time as such abuse of law, there still exists a large section of the population which does need 498A in its crude and unforgiving form. If only slum immersions can be made a necessary part of our training systems, the hurt could be felt and understood by one and all. Those in power would know suffering. They would come to relate more appropriately to the poverty struck fair gender that needs specific legal help. These are the people who deserve the rights granted under section 498a as it is. Authorizing detention without recording reasons as aforesaid by the Judicial Magistrate concerned shall be liable for departmental action by the appropriate High Court. Though Rajesh Sharma (supra) takes note of Gian Singh (supra), yet it seems to have it applied in a different manner. The seminal issue is whether these directions could have been issued by the process of interpretation. This Court, in furtherance of a fundamental right, has issued directions in the absence of law in certain cases, namely, Lakshmi Kant Pandey v. Union of India, Vishaka and others v. State of Rajasthan and others and Common Cause (A Registered Society) v. Union of India and another and some others. In the obtaining factual matrix, there are statutory provisions and judgments in the field and, therefore, the directions pertaining to constitution of a Committee and conferment of power on the said Committee is erroneous. However, the directions pertaining to Red Corner Notice, clubbing of cases and postulating that recovery of disputed dowry items may not by itself be a ground for denial of bail would stand on a different footing. They are protective in nature and do not sound a discordant note with the Code. When an application for bail is entertained, proper conditions have to be imposed but recovery of disputed dowry items may not by itself be a ground while rejecting an application for grant of bail under Section 498-A IPC. That cannot be considered at that stage. Therefore, we do not find anything erroneous in direction Nos. 19(iv) and (v). So far as direction No. 19(vi) and 19(vii) are concerned, an application has to be filed either under Section 205 CrPC or Section 317 CrPC depending upon the stage at which the exemption is sought. In the aforesaid analysis, while declaring the directions pertaining to Family Welfare Committee and its constitution by the District Legal Services Authority and the power conferred on the Committee is impermissible. Therefore, we think it appropriate to direct that the investigating officers be careful and be guided by the principles stated in Joginder Kumar (supra), D.K. Basu (supra), Lalita Kumari (supra) and Arnesh Kumar (supra). It will also be appropriate to direct the Director General of Police of each State to ensure that investigating officers who are in charge of investigation of cases of offences under Section 498-A IPC should be imparted rigorous training with regard to the principles stated by this Court relating to arrest. In view of the aforesaid premises, the direction contained in paragraph 19(i) as a whole is not in accord with the statutory framework and the direction issued in paragraph 19(ii) shall be read in conjunction with the direction given hereinabove. Direction No. 19(iii) is modified to the extent that if a settlement is arrived at, the parties can approach the High Court under Section 482 of the Code of Criminal Procedure and the High Court, keeping in view the law laid down in Gian Singh (supra), shall dispose of the same. With the aforesaid modifications in the directions issued in Rajesh Sharma (supra), the writ petitions and criminal appeal stand disposed of. There shall be no order as to costs. Our society at the same time carries in its fold – the educated, self-dependent and empowered women belonging to a modern social set-up. Ironically, the relief of 498a in its unaltered form, is just as easily available to these empowered women who tend to abuse it by crying victim falsely. Most of the time the actual friction is because of the conflict in the thought process, family aspirations, status etc. But, in most of the cases, women do not hesitate in going by the proverb “everything is fair in love and war”. Thus, they invoke the powers of section 498-A as a blackmailing shield. HOW CAN POLICE CHECK THE ABUSE OF 498a? A just and fair investigation is the first step towards ensuring justice in the matter. The complainant should be properly examined and statement should be recorded. History of both the complainant, the accused and their family members be examined. Investigation of prima-facie evidence of the complaint must reveal the social status, residential status, family background, liabilities, education, and economic strength of the parties. A timeline of events – as alleged, should be prepared and the presence of the victim and the accused be verified. List of expenditure/ articles should be properly verified. The online social history of the parties must be taken into account. Email, WhatsApp, text communication should be taken into account. Bank statements and ITR should be taken into account. Marriage photos and videos should be examined. Recorded telephonic conversations, call records and tower location should be called for. MLC/ MLR or any pictures/ videos related to abuse, hospital bills, police complaints etc. are to be examined. If the wife is about to leave or is leaving with all her jewelry and belongings, report it to the police instantly and have it recorded. Do not run away from the preliminary investigation when called by the police. To ensure that police conducts a just and fair investigation, cooperate with them. Resort to email conversation if the situation has become dense. Do not bribe or influence. Do not sign anything under pressure or influence. Do not admit to anything on phone or in writing in a casual manner. Specifically deny any allegation being put against you. Start preparing your side of narrative and search for proofs. The above article is authored by Mr. Ambransh Bhandari who is a practicing advocate in the High Court of Punjab & Haryana. Mr. Bhandari is a champion orator and a renowned lawyer in Chandigarh who also runs a law firm by the name of B&B Associates LLP. Mr. Bhandari is a consultant and practicing lawyer in Constitutional, Criminal and Divorce matters. He is a lawyer in Chandigarh who specializes in 498a matters and is an expert in countering atrocious acts by police. Mr. Bhandari has been saving innocents from being harassed and has successfully averted many legal blackmail situations.